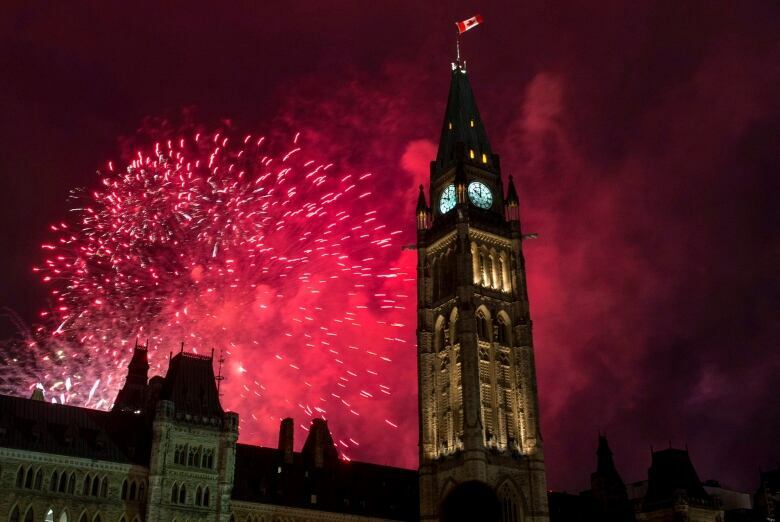 A huge fireworks display capped off Canada Day festivities in Ottawa on Parliament Hill, after acts from pop sensation Kiesza and other musicians entertained the crowd. Earlier Wednesday, Prime Minister Stephen Harper said Canadians will continue to overcome all threats they face from outside forces, as he praised members of the Armed Forces during the day's celebrations. "In the Baltic and in Eastern Europe, they are supporting our friends and allies who face Russian aggression. And, in Iraq and in Kuwait, they are fighting the terrorists there, to keep us safe here," Harper said Wednesday at Canada's 148th birthday bash on Parliament Hill. "Now friends, as we saw right here in our Parliament, this threat is everywhere today," he said, referring to the shooting last October outside the National War Memorial that claimed the life of Cpl. Nathan Cirillo while he was on honorary guard. "But we have faced great threats before, many times, and we have overcome them and we shall overcome them once more." Harper said Canada "stands unique among the nations," and that in times of economic and political turmoil, the country is "an island of stability." "At this moment in our history, there is no better place in the world to live, to work, and to raise a family. No better place in the world than this country Canada," Harper said. Thousands of Canadians decked out in their finest red and white attire flocked to Ottawa for the Canada Day celebrations in the capital for the day-long event. CBC's cross-country coverage kicked off with CBC News chief correspondent Peter Mansbridge hosting a special from Ottawa until 2 p.m. on CBC-TV, CBC News Network and CBCNews.ca. He was joined by CBC's Heather Hiscox from Newfoundland and Paul Hunter in Vancouver, and for the first time ever, CBC had Canada Day celebrations from the Arctic Circle in Inuvik. Rosemary Barton and Jelena Adzic followed the ceremonial and concert events on Parliament Hill. Gov. Gen. David Johnston also joined Harper in the festivities. Earlier, in his Canada Day statement, Harper said Canadians are "blessed to live in the best country in the world." He called on Canadians to "celebrate the people who make Canada great" and to "re-dedicate themselves to the service of the country." NDP Leader Tom Mulcair's issued a Canada Day statement that hinted at the election on the horizon. He was expected to attend events Wednesday across the Greater Toronto Area, a critical campaign battleground. "We have many reasons to be proud to be Canadian, but much work remains to be done," Mulcair said. "The NDP has a clear vision to build a more sustainable society. Canadians can count on the NDP to bring concrete proposals to Ottawa to make life more affordable for families and make Canada a fairer country." Liberal Leader Justin Trudeau was also spending the day in the GTA and southwestern Ontario. He issued a holiday statement that lauded Canada as "a place of fairness and of opportunity; a place where people from every imaginable country and culture, who speak every language, live and work, and build and thrive together." Trudeau added: "We are stronger not in spite of our differences, but precisely because of them. For much of the world, Canada represents the most hopeful vision of what the future can look like." Some of the country's top musical talents will be taking to the stage throughout the day. Calgary pop sensation Kiesza, featuring the 26-year-old Hideaway, will headline the special evening concert broadcast. The show included performances by Toronto's reggae pop outfit Magic! and Alberta-raised country singer Gord Bamford. Montreal's Jonas and the Massive Attraction. Dakar-born, Quebec City-raised singer Karim Ouellet. Mann was also slated to sing the national and royal anthems earlier in the day. 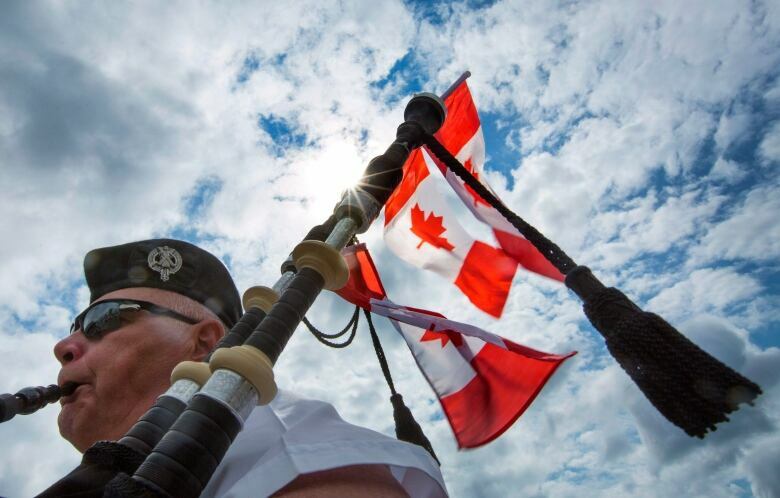 Mark Cripps, of the St. Andrew's Pipe and Drum Corps plays during the Canada Day Parade in Mississauga, Ont. (Peter Power/Canadian Press)CBC also hosted Canada Day-related programming across the public broadcaster's network. Lucy van Oldenbarneveld of CBC News Ottawa hosted The CBC Canada Day Songwriters Circle on CBC Radio One on July 1 at 12 noon/1 p.m. AT/1:30 p.m. NT. CBC Music's Lana Gay revealed CBC Music's top five Canadian bands of all time on Beyond the Charts on CBC Radio One at 4 p.m./4:30 p.m. NT. On June 30, CBCMusic.ca completed its countdown the 100 best Canadian bands ever. Check out the list at CBCMusic.ca/top100. On Canada Day, Radio 2 and its hosts celebrated their favourite bands from the list. At 6 p.m (6:30 NT) Rich Terfry counted down the top 20. CBCBooks.ca is shined a spotlight on young adult writing with the list 100 Young Adult Books That Make You Proud to be Canadian. ICI Musique aired the best of Canadian music from all genres on July 1 from 6 a.m. until 5:30 p.m.